The aim of this study was to perform the adaptation of Lactobacillus paracasei NRRL B-4564 to substrate through adaptive evolution in order to ensure intensive substrate utilization and enhanced L (+)-lactic acid (LA) production on molasses-enriched potato stillage. 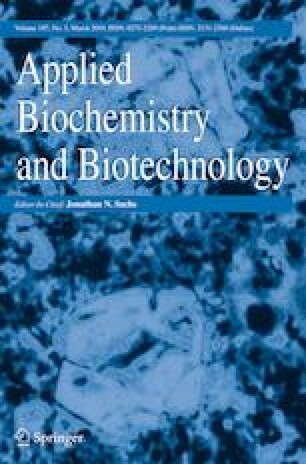 To evaluate the strain response to environmental conditions exposed during the adaptation process and to select the best adapted cells, the antioxidant activity and LA-producing capability were assessed in batch fermentation. The most promising adapted strain was further used in a pulsed fed-batch mode. Among three selected adapted strains, L. paracasei A-22 showed considerably improved antioxidant capacity, demonstrating more than onefold higher 2,2-diphenyl-1-picrylhydrazyl (DPPH) radical-scavenging rates compared to parent strain. This strain also exhibited superior LA production in batch fermentation and reached 89.4 g L−1 of LA, with a yield of 0.89 g g−1, a productivity of 1.49 g L−1 h−1, and an optical purity greater than 99%. Furthermore, in fed-batch mode L. paracasei A-22 resulted in 59% higher LA concentration (169.9 g L−1) compared to parent strain (107.1 g L−1). The strain adaptation to molasses environment, performed in this study, is a rather simple and promising method for enhancement of LA production on the complex agro-industrial substrate. Authors acknowledge Milica Carević, PhD, for help in HPLC analysis. Research presented in this paper was funded by the Ministry of Education, Science and Technological Development, Republic of Serbia, project number TR 31017 and Scientific Project#1 between People’s Republic of China and the Republic of Serbia 2017–2019.